Image from The Cemetery Hand Book: A Manual of Useful Information on Cemetery Development and Management (Chicago: Allied Arts Pub. Co., ). From CRL collections. Formal burial in the United States, prior to 1860, was primarily restricted to interment of the body on the grounds of a church or meetinghouse, or occasionally within the church itself. The bell of the church was rung during the last hours of life, and after death, in an effort to keep evil spirits at bay, and to give the departing soul some advantage upon its way. The body was, in English tradition, placed in a casket. Graves were laid facing east and west, with the head to the west; all available space was used, with burials very close together, and at times on top of each other. As burial was within the church yard, tombstones were commonly seen on meeting day, reminding the congregation of the dead, and again, of death’s inevitability. Headstones were, if afforded, carved with representations such as death’s head or Father Time extinguishing the candle of life; and also carried verbal warnings of mortality, and of the necessity for virtue, such as: “Fugit hora” (time flies) and “Memento mori” (remember that you must die). Cemeteries were dreary places affording little room or light for vegetation, and thereby not encouraging the passerby to linger and to appreciate. As the 19th century progressed, towns grew to cities, and population increased proportionally. For reasons of public health and overcrowding, burial grounds began to be located outside of population centers, no longer on church ground. These cemeteries spawned the “Rural” Cemetery Movement, beginning in 1831 with Mount Auburn, Boston; Laurel Hill, Philadelphia (1836); Greenwood, N.Y. (1838); Lowell, Mass. (1841); Evergreen, Portland, Maine (1855); Forest Hill, Madison, Wisc. (1858); and countless others as the country and movement expanded. Extensive discussion of landscape development for such cemeteries has cited the need for green grass, flowers, shrubs, and trees to form “a harmonious effect, pleasing to the eye.”[fn]Howard Evarts Weed, Modern Park Cemeteries (Chicago: R. J. Haigt, 1912), 71–83. [/fn] The cemetery entrance with its hardware and plantings “should be so pleasing that visitors will wish to be buried therein.” Trees were a necessity, including evergreens: spruce and pines, and deciduous varieties: excepting those which are messy, rapid growers, or unsuitable to the area; “avoid the Weeping Mulberry, for a cemetery contains enough things to suggest sorrow without enhancing this feature in the landscape.” Flowering shrubs, massed, were highly recommended including: lilac, snowberry, hydrangea, forsythias, honeysuckle, dogwood, and verbena among the many. Flowers: perennial, annual, and even ornamental grasses, again massed, were desirable with varieties such as phlox, hollyhock, poppy, geranium, salvia, and roses leading the lists. Advertisement from Modern Cemetery (March 1, 1891). From American Periodicals from the Center for Research Libraries. It has been argued that the rural cemetery, serving as an oasis within the expanding urban and industrial landscape of the country, actually became the foundation of the American park movement. [fn]Thomas Bender, “The “Rural” Cemetery Movement: Urban Travail and the Appeal of Nature,” New England Quarterly, Vol. 47, No. 2 (June 1947): 206–11. [/fn] Leaving the city and seeking rural beauty had its merits, but was not available to all, while a public mall or promenade, centrally located in the city itself, would serve more of the citizenry. 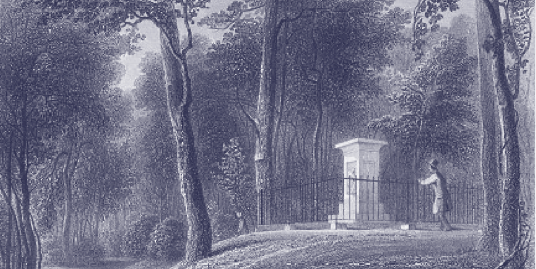 By the end of the 19th century, the role of the cemetery as a place of escape from the city had been supplanted by the establishment of parks, and by the blurring of city and country as suburbia evolved. Natural sanctuary became rare as “sprawl” increased and landscape homogenized. Again, lost was the place of beauty in which ease of tensions could be found; again, a new movement evolved; this time, the wilderness movement. The Cemetery Handbook: A Manual of Useful Information on Cemetery Development & Management. Chicago: Allied Arts Pub. Co., [1921?]. Cleaveland, Nehemiah. Green-Wood Illustrated, In Highly Finished Line Engraving, From Drawings Taken on the Spot. New York: R. Martin, 1847. Smith, John Jay. Designs for Monuments and Mural Tablets: Adapted to Rural Cemeteries, Church Yards, Churches, and Chapels. New York: Bartlett & Welford, 1846. Weed, Howard Evarts. Modern Park Cemeteries. Chicago: R. J. Haight, 1912. Bender, Thomas. “The “Rural” Cemetery Movement: Urban Travail and the Appeal of Nature.” New England Quarterly. Vol. 47, No. 2 (June 1947): 196–211. Forest Hill Cemetery Committee of Historic Madison, Inc. A Biographical Guide to Forest Hill Cemetery: Madison, WI. Madison, Wisc. : Historic Madison, 1996.